BEFORE & AFTER ---- Astounding!!!! This is a great example of posture misalignment. A severe case. Think she was in pain? 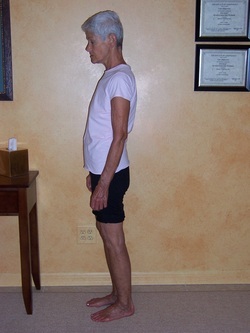 YES, this is the SAME woman AFTER using this method of alignment therapy. BEFORE & AFTER --- Awesome!!! This is a photo of a woman who was not posing or slumping purposely for the photo. This was her actual real posture. This woman's pelvis tips too far forward, the hips and knees bowed forward, shoulders round forward and the head came far forward, the feet turned outward "everting" -- all in an effort to stay upright and compensate for imbalanced deviated posture. The original Blue-Print design that distributes weight and gravity equally is gone. These are just a few of the posture deviations she had. Three other photos were taken showing her other profile, and the front and back of her body. Other deviations were visible as well: hip and shoulder elevations and rotations. It was impossible for her to stand erect. This man's belly button, sternum, crotch should be on the red center line. Here you see all her primary load joints (ankle, knee, hip, shoulder) stacked one above the other in a vertical line and at 90 degrees to the body. Plus the center line of gravity runs vertically, directly through all primary load joints. Notice her pelvis is level or "neutral", not tipped forward and not tipped back. Her hips are back underneath her upper body and over her lower body. Her chin is now level with the ground versus pointing down. Her head is back balanced over her spine. After his first 2 hour session, you can see he is bearing weight more equally and especially putting weight in the right leg, hip and foot. Muscles can move bones out of place over time and muscles can move those bones back into place too - with the right stimulus. "The body has bilateral function. ...Let's say Bifunctional. The right and left sides are designed to do the same things, and the component parts --bones, muscles, ligaments, tendons -- are identical. Not vaguely similar, identical. Nearly every day I have someone come into my clinic and ... inform me they are the exception to this rule of bifunctionality. "My right arm is longer than my left arm," "...one leg is shorter than the other." I have heard it enough times that I can reply in my sleep. "Did you suffer a traumatic injury to the growth plate as a child before you attained your full adult height?" "well, no..I don't think so." Hmmm, childhood injuries--big time hurt not minor bumps and jolts -- are the primary cause of an asymmetrical skeletal structure. And one person out of several million may be affected by a birth defect. I go on to suggest that something that is happening to one hip isn't happening to the other. Notice I didn't say one hip is different. It isn't." Any differences between the left and right side of the body, front and back of the body or any combination of imbalances will lead to some form of dysfunction. Common postural changes can include elevated hip or shoulder, rotation of trunk or hip, “knock” knees or bow legs and can occur as a result of lifestyle factors and injury. Therefore if your body has experienced any changes or deviations from the original blue- print design, then we call it a Posture Deviation. Work and weight load is transferred to other parts of the body ill-equipped and not designed to do that job. Over time, this dysfunction leads to pre-mature wear and tear on the muscular and skeletal systems. Thus the cycle of pain and limited mobility begins. When we hurt we move less or change how we move. The deep postural support muscles become latent and atrophy, and the muscles doing all the compensating get stronger and tighter (pulling us out of side-to-side and front-to-back balance). Now we have a dysfunctional muscular and skeletal system deprived of stimulus and motion. We hurt more so we do less. Pain sets in and the cycle continues. 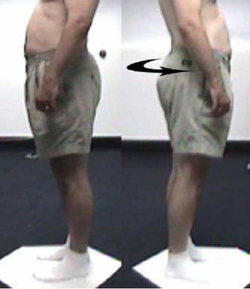 Postural deviation at one or more weight bearing load joints can cause muscle, bone and joint compensation both directly at the site, and throughout the entire body. We evaluate a client's symptoms in reference to the blue-print of a neutral and pain free posture. Each client's posture and physical function are evaluated and then cross referenced to pain symptoms. From that an analysis, an individualized exercise and stretching program is developed to address the specific postural disparities and dysfunctions within the client. The human body is amazingly versatile! It will recruit any part of the musculoskeletal system it needs to in order to maintain mobility. Unfortunately, we begin to utilize muscles for movement that were primarily designed for support, its support system then becomes compromised. Because the body works together as a unit, no one part will operate in isolation. Frequently the site of pain is a symptom of dysfunction elsewhere. Back pain, shoulder pain, wrist and even foot pain for example, can often be a symptom of improper engagement of the hip and pelvic musculature. By changing what is happening at the hips, the symptomatic pains will be relieved. When the body moves back into alignment, and undue stresses begin to release, the internal organs will return to optimal function and noticeable improvements can often be found in the cardiovascular, respiratory and digestive systems. 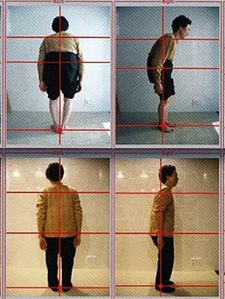 Clients report the added effects of feeling taller, straighter, more relaxed and at the same time have far more energy. Many clients say they sleep better and some loose weight. With this method of posture alignment, you will be recruiting muscles to work that haven't worked in awhile which increases metabolism and in turn, burns calories. Fabulous!! All of this contributes to an enhanced quality of life.